SOUL FOOD for Young Adult Communities: July 28, 2013: 17th Sunday in Ordinary Time. SOUL FOOD for Young Adult Communities: July 28, 2013: 17th Sunday in Ordinary Time. Year of Luke. Gospel for this Sunday: Luke 11,1-13, re the OUR FATHER, and prayer. Find it in your own Bible or Sunday Missal, or click here. 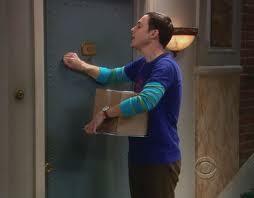 Sheldon Cooper at his friend's door! From 'The Big Bang Theory' TV series. Letter to Sinead, Mark and Friends, -young adults in search of faith and understanding. (This week’s letter is written by Sarah Kelly, who is in her 20′s. Thanks, Sarah!). Do you ever wonder about your prayer? Am I praying right? How should I pray? Does God hear me? We constantly worry about how we are praying that we often forget to pray. Here, the disciples of Jesus face a similar dilemma. They ask him, “Lord, teach us to pray.” When reading this particular piece of Scripture I always see Jesus smiling at His disciples and looking at them with a gaze of pure love. His followers still don’t realize fully who is in their midst. If they could only see that just being with Him is itself a prayer, how comforted they would feel. Jesus then turns to them, and He utters the most powerful and beautiful prayer. Pope John Paul II stated that the only way to approach the contemplation of Christ’s face is by listening in the Spirit to the Father’s voice. Now, it is a different translation to the one we often pray at Mass, or in private prayer. But the sentiment is still the same. We are praying to God, the Father, whose name is to be always held as holy. We anticipate the coming of His kingdom, and we ask Him to give us daily our bread who is His son, Jesus. We ask Him to forgive the hurt we cause Him and others, but also that we may forgive those who hurt us, and we ask not to be put to the test. What this prayer signifies, ultimately, is our relationship with the One we call ‘Our Father’. By saying this prayer, what we are in fact declaring is our absolute reliance and total dependence on God. This does not make us weak, rather quite the opposite. The fact that we can stand, sit, or kneel in the presence of the One who made us, and call Him Our Father makes us strong. Now my friends, what did Jesus do next? He wasn’t going to wander off topic, as some of us may do in prayer. But rather, He continues to teach them about prayer. I wonder if they understood this? Sometimes we forget that the people whom Jesus chose to follow Him were just like you and me. Prayer is ultimately a conversation between you and God, and no matter how many times you repeat the same thing over and over again, He hears you. It might not seem that way, but eventually He will “get up and give his friend all they want”. And Jesus knocks at our door, too! the door only to end the dreaded chorus. 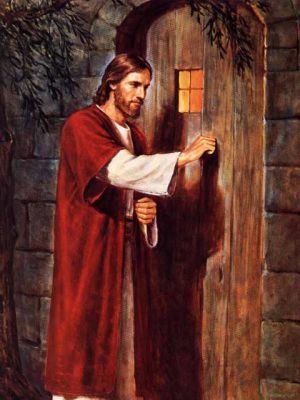 And yet, in today’s Gospel we read that “the one who knocks will always have the door opened to them”. I guess it pays to be persistent. Imagine that it is God knocking on your heart, just like the character Sheldon, waiting patiently for you to open it to Him, and vice versa. When you pray, you are knocking, as it were, on the very heart of God, and even though you feel the door is closed, it is open. Sometimes we are so afraid to keep knocking because we are in fear of being rejected, hurt and let down. We cannot imagine that something good is behind that door. When the disciples asked Jesus to teach them to pray, He taught them to call God ‘Father’. Therefore, in this light, “what Father among you would hand his son or daughter a stone when they asked for bread? Or hand them a snake instead of a fish? Or hand them a scorpion if they asked for an egg?”. God doesn’t give us what we want, He gives us what we need. God is not like any other. Not only does He give us what we need, but so much more since “how much more will the Heavenly Father give the Holy Spirit to those who ask him!”. My oul friend, St. Therese the Little Flower, poignantly notes that “prayer is a surge of the heart; it is a simple look turned toward heaven, it is a cry of recognition and of love, embracing both trial and joy”. The Danish Philosopher, Theologian and poet Soren Kirkegaard once said about prayer, that “praying does not mean listening to yourself speak; praying means calming down and being still and waiting until you hear God”. Today, my one hope for you is that in your prayer, you hold nothing back. Do not be afraid, and tell our Father everything. Just talk to Him and above all, just BE in His presence. Keep knocking on the door, because behind it, God’s very self is listening. ← SOUL FOOD for Hungry Adult Communities: July 28th 2013: 17th Sunday in Ordinary Time.